To most of us, the name “Sathyam” signifies a movie experience. It’s been one of Chennai’s leading movie halls since 1974 and over the years, it’s become a much fancier experience than we all remember it to be. It’s become a place to go to do more than just watch a movie if you can believe it. Going to Sathyam now can entail a long list of things to do, which makes it a story worth telling. So, if you’re looking to get out of the house, but not really want to watch a movie, here are some things you can do at Sathyam. Calling all gamers! The top floors of the Sathyam building are taken over by a gaming center known to all as Blur. They have PC gaming, a bowling alley, arcade games as well as console gaming. It is the best place to be if you’re looking to escape from the hustle, bustle, and rain of the city for a few hours. Because once you’re tucked away inside Blur, the rest of the world ceases to exist. 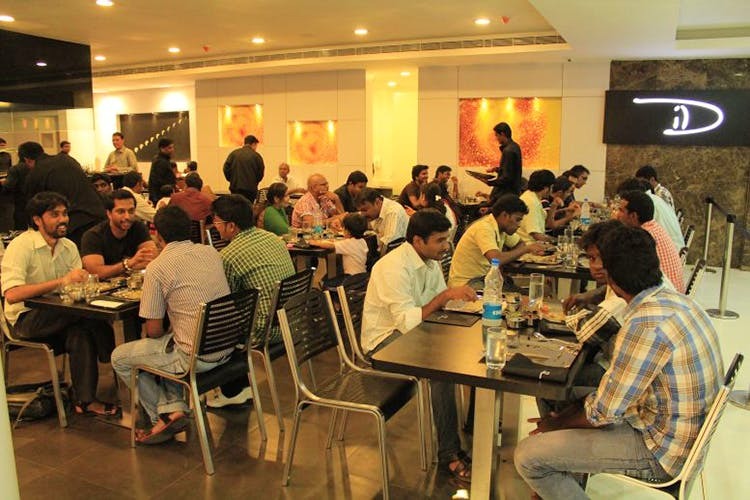 How can a place like Sathyam not have a restaurant? iD, for those who don’t know, is a South Indian vegetarian restaurant that serves everything. They have idli (podi idli too! ), vada, dosas (including a chocolate dosa! ), tea time snacks like onion pakoda and bhaji, uthappam, speciality dishes like ghee pongal and of course, South Indian meals. Skip the movie and go straight for the food, because everything on their menu is absolutely delicious. This is a new addition to the ground floor of Sathyam. As soon as you walk in, you’ll find two pods attached to a hydraulic base. You can climb in, a staff member straps the VR device onto your face and you’re off on an adventure. So far, mostly kids and youngsters have been trying it out, but that doesn’t mean everybody can’t! And for those standing by, there’s a screen set up above the pods, that allows you to see what’s happening behind those VR screens. Go try it out!